A palm with many names. Butterfly Palm is the most funny one, where does it come from? Is it butterflies enjoying the fruits? Flowers? Tell me, if you know! On pictures certainly Cane palm suits best. 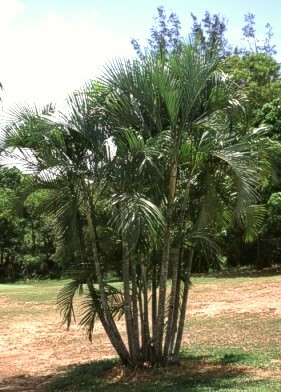 And guess where the name Madagascar palm comes from? Anyway I found it in the gardens of any Tropical country I've been to. Must be enjoyable to keep.